An internal condition detection system detects a charging and discharging current and a terminal voltage of a charge accumulating device, and learns the internal condition quantity of the charge accumulating device through a neural network based on the current values and the terminal voltage values. The current values and the terminal voltage values are stored in a buffer and supplied as time-series data so that historical information is included. Further the neural network is fed with type information of the charge accumulating device. The type information is stored in a memory. In addition, neural network coefficients obtained through learning may be written into ROM or the like before shipment. At the same time, the type information of a charge accumulating device may be stored beforehand in ROM or the like. Thus, after marketed, the internal condition of the charge accumulating device can be detected with accuracy and ease. Even when the charge accumulating device is replaced with one of a different type, that can be easily coped with by rewriting the ROM. FIG. 15 is a structural diagram of the neural network of two-output system wherein an internal impedance of a storage battery is learned in the sixth embodiment of the present invention. Referring to FIG. 1 showing an internal condition detection system, numeral  1 denotes a storage battery, which is a charge accumulating device whose condition is to be detected. For the storage battery 1, a lead storage battery, a nickel-metal hydrate battery, a lithium cell, or the like can be used. Numeral  2 denotes an electric generator driven by a vehicle-mounted engine (not shown). Numeral 3 denotes a vehicle-mounted electrical load or equipment. Numeral 4 denotes a current sensor which detects a charging and discharging current of the storage battery 1, and transmits detection values in the form of digital signals. Numeral  5 denotes a condition detector for the storage battery 1. The condition detector 5 comprises a buffer portion 51 which is fed with the output signal of the current sensor 4 and the terminal voltage detection signal of the storage battery 1, and stores these input values; and a neural network portion 52 which is fed with signals processed at the buffer portion 51 and outputs the internal condition value, that is, remaining capacity SOC of the battery 1. The electricity generated by the generator 2 is optimally controlled by a generator controller 6 according to the output signal (SOC) from the condition detector 5 and other information 61. The configuration of the neural network portion  52 in the condition detector 5 is schematically shown in FIG. 2. The neural network portion 52 is of the three-layered feedforward structure, and carries out learning by the error back propagation method. Input information equivalent to a predetermined number of samples is inputted to respective cells 521 so that the history of current values detected by the current sensor 4 and terminal voltage values is included. Here, a data row (It-1 to It-m) having a history is expressed as a vector. The historical data row of current is designated as a current history vector, and the historical data row (Vt-1 to Vt-m) of voltage is designated as a voltage history vector. Data is sampled by the following method: as illustrated in FIG. 3, a window function which reads in data for the period between the present time and a time a predetermined time before the present time (m pieces in terms of number of samples) is multiplied by a sampling value. Then, the result of the multiplication is accumulated in the buffer  51. In this embodiment, 1.0 is taken for the window function value in the interval m, and 0.0 is taken for the other window function values. That is, data indicated by the solid line in FIG. 3 is taken in as it is. By successively moving the window function in the direction of arrow in the figure, actual data can be taken in. As described above, the input data include two vectors (current history vector and voltage history vector). Therefore, the number of cells 521 in the input layer in the neural network portion 52 is 2 m, as illustrated in FIG. 2. The remaining capacity of the storage battery  1 at the present time is caused to be learned beforehand with the current history vectors and voltage history vectors in a predetermined charging and discharging pattern. Then, the coupling coefficients between layers are determined to build the neural network. First, the input data to the j-th cell  521 in the input layer is assumed to be Inj, and the coupling coefficient for the j-th cell 521 in the input layer and the k-th cell 522 in the intermediate layer 522 is assumed to be Wjk. Then, the input signal INPUTk(t) to the k-th cell 522 in the intermediate layer is expressed by Equation (1) below. The output signal OUTk(t) from the k-th cell  522 in the intermediate layer is expressed by Equation (2) below. Further, the coupling coefficient for the k-th cell  522 in the intermediate layer and the cell 523 in the output layer is assumed to be Wk. Then, the input signal INPUTo(t) to the output layer is expressed by Equation (4) below. The coupling coefficient Wk between the k-th cell  522 in the intermediate layer and the cell 523 in the output layer is updated by Equation (6) below. Next, the rule for updating the coupling coefficient Wjk between the k-th cell  522 in the intermediate layer and the j-th cell 521 in the input layer will be described. First, appropriate initial values are set for the coupling coefficients Wk and Wjk of the neural network portion  52 (step S100). At this time, the initial values can be appropriately determined using random numbers or the like. Next, a voltage value and a current value for learning are inputted to the neural network portion  52 (step S101). 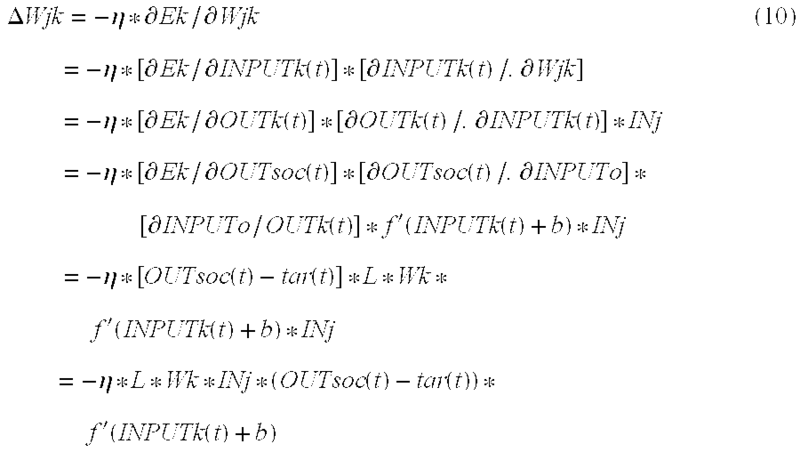 Then, using the initial values of the coupling coefficients Wk and Wjk and the input values inputted to the neural network portion 52, a remaining capacity SOC is computed (step S102). Next, the error function Ek is computed (step S103), and whether the error function Ek is smaller than the predetermined infinitesimal value th is determined (step S104). When the determination at step S 104 reveals that the error function Ek is greater than the infinitesimal value th, the quantity ΔW of updating for the coupling coefficients Wk and Wjk defined in the above process of learning is computed (step S105). Thus, the coupling coefficients Wk and Wjk are updated (step S106). Thereafter, voltage and current values for learning are inputted to the neural network portion 52 to compute the remaining capacity SOC again. When the determination at step S104 reveals that the error function Ek is smaller than the infinitesimal value th, the learning process is terminated (step S107). With respect to some objects, the following is known: the past information cannot be disregarded at the present time, but the degree of its influence on the present time is lowered as it temporally gets away from the present time. For such an object, the above way of giving data accelerates learning cycles. This is thought to be because of the following: even when data is given as illustrated in FIG. 8, the internal coupling coefficients are updated by learning of the neural network portion  52 so that those from the past input cells will be suppressed. With respect to how the distribution of the coupling coefficients Wk and Wjk in the process of determination and after determination in the error back propagation method is correlated with input values and teacher values, an appropriate rule is applied. Further, information about the temperature of the storage battery  1 is added to input when battery remaining capacity is learned. Thus, the accuracy of computation is enhanced. Further, a network of two-output system may be constituted to learn the internal impedance of the storage battery  1. The internal impedance of the storage battery 1 is closely related to the conditions of deterioration in electrolyte, electrode plates, or electrode lattices constituting the storage battery 1. Therefore, this is a highly effective method for computing the condition of deterioration in the storage battery 1. The following table lists the accuracy of detection obtained by the following procedure: a plurality of storage batteries  1 including a deteriorated storage battery 1 are mounted on a vehicle, and driving is carried out in 10-15 mode. At this time, the range of fluctuation in current value is sorted into three: 5 A to 15 A (first range of fluctuation), 5 A to 30 A (second range of fluctuation), and 5 A to 55 A (third range of fluctuation). With respect to the input of the current values whose range of fluctuation is sorted, learning is carried out on a storage battery  1. Then, the storage battery 1 about which learning has been carried out is replaced with another, and driving is carried out in LA#4 mode. Data obtained at this time is sorted and processed under the conditions of the first to third ranges of fluctuation. The tabulated accuracy of detection is thus obtained. The charging reaction and the discharging reaction in the charge accumulating device  1 are chemical reactions. Therefore, the charging reaction and the discharging reaction are vastly different from each other. After the charge accumulating device  1 is charged, the voltage is apparently higher than the ordinary voltage due to the influence of polarization voltage. For this reason, learning of the neural network is partly easy and partly difficult due to the influence of charging. FIG. 10A illustrates the accuracy of detection obtained by the following procedure: a plurality of storage batteries  1 including a deteriorated storage battery 1 are mounted on a vehicle, and driving is carried out in 10-15 mode. At this time, learning is carried out with respect to the input with condition selected in this embodiment. Then, the storage battery 1 about which learning has been carried out is replaced with another, and driving is carried out in LA#4 mode. Data obtained at this time is sorted and processed. The accuracy of detection in the figure is thus obtained. In the fourth embodiment, as shown in FIG. 11, the condition detector  5 has no buffer but has a memory 53, which stores the type information of the storage battery 1. As shown in FIG. 12, the neural network portion 52 in the condition detector 5 of feedforward structure is comprised of three layers: three input layer cells 521, Q intermediate layer cells 522, and an output layer cell 523. The neural network portion 52 carries out learning by the error back propagation method. Input information, that is, the current value and terminal voltage value are inputted to the respective cells 521. Further, the type information of the storage battery 1, for example, hour rate capacity are inputted. The five-hour rate capacity of types representative of lead storage batteries for automobile is digitized and inputted as continuous quantity. For example, for “type designation: five-hour rate capacity [Ah]: input value,” such combinations as listed below may be adopted. Representation of type information as continuous quantity produces some advantages. For example, it is assumed that learning is carried out at the neural network portion  52 with three combinations, 34B19:27:27, 55D23:48:48, and 105D31:64:64. Thus, types 46B24:36:36 and 80D26:55:55 about which learning has not been carried out yet can be coped with by interpolation based on the result of the learning. In the fifth embodiment, as input values to the neural network portion  52, a data row having a history of the charging and discharging current values and terminal voltage values of the storage battery is expressed as vector in the similar manner as in the first embodiment. The historical data row of current value is designated as current history vector, and the historical data row of terminal voltage value is designated as voltage history vector. Data is sampled in the same way as in the first embodiment (FIG. 3). The data taken in is accumulated in a buffer portion  53 illustrated in FIG. 13, and is inputted to the neural network portion 52 in succession. In this case, in addition to the five-hour rate capacity, the internal impedance of the charge accumulating device as it is new is given as battery type information as shown in FIG. 14. The network structure supplied with input as described above has two vectors (current history vector and voltage history vector) and two pieces of type information as input data. Therefore, the number of cells  521 in the input layer of the neural network portion 52 is 2m+2. Thereafter, the remaining capacity of the storage battery  1 at the present time is caused to be learned with the current history vectors and voltage history vectors in a predetermined charging and discharging pattern. Then, the coupling coefficients Wk and Wjk between layers are determined to build the network. As described above, the voltage-current characteristic of a lead storage battery for automobile has weak correlation under a specific remaining capacity, as illustrated in FIG. 5. With respect to an object wherein input and output are in one-to-one correspondence, the neural network portion  52 highly effectively learns the object and finds correlation. On the other hand, with respect to an object without one-to-one correspondence, such as a lead storage battery, the neural network portion 52 cannot carry out learning with accuracy. However, when the above historical information is superposed on the lead storage battery, correlation including hysteresis appears, as illustrated in FIG. 6, and one-to-one correspondence can be found. Therefore, when charging and discharging current values and terminal voltage values are inputted as history vectors, the accuracy of detecting the internal condition of the storage battery 1 is dramatically enhanced. This is thought to be because of the following: even when data is given as illustrated in FIG. 4, the internal coupling coefficients Wk and Wjk are updated by learning of the neural network portion  52 so that those from the past input cells 521 will be suppressed. With respect to how the distribution of the coupling coefficients Wk and Wjk in the process of determination and after determination in the error back propagation method is correlated with input values and teacher values, an appropriate rule is applied. In the sixth embodiment, as shown in FIG. 15, a network of two-output system may be constructed to learn the internal impedance of the storage battery  1. The internal impedance of the storage battery 1 is closely related to the condition of deterioration in electrolyte, electrode plates, or electrode lattices constituting the storage battery 1. Therefore, this is a highly effective method for computing the condition of deterioration in the storage battery 1.
wherein the current values and the terminal voltage values are supplied so that historical information thereof are included. wherein the time-series data is accumulated and then inputted to an input layer of the neural network. wherein data obtained by superposing a time frame on time-series data constituting the historical information and cutting the data is inputted to the input layer of the neural network. wherein a time interval of sampled data inputted is made longer as it goes farther back into the past from an internal condition quantity learning time with respect to time-series data constituting the historical information. wherein the internal condition quantity of the charge accumulating device is a dischargeable remaining capacity. wherein the internal condition quantity of the charge accumulating device is an internal impedance of the charge accumulating device. wherein the internal condition quantity of the charge accumulating device is a dischargeable remaining capacity of the charge accumulating device and an internal impedance of the charge accumulating device. wherein the neural network is fed with condition quantities related to the temperature of the charge accumulating device. a first learning means which, with respect to the input of the current values whose amount of fluctuation due to variation is within a first predetermined range, learns the internal condition of the charge accumulating device and produces an output. a second learning means which, with respect to the input of the current values whose amount of fluctuation is within a second predetermined range larger than the first predetermined range, learns the internal condition of the charge accumulating device and produces the output. wherein the amount of fluctuation is computed using a variance or standard deviation of the current values. a charging current learning means which, with respect to the input of the charging current values, learns the internal condition of the charge accumulating device and produces output. a discharging current learning means which, with respect to the input of the discharging current value, learns the internal condition of the charge accumulating device and produces output. wherein the current values and the terminal voltage values are supplied so that correlation data correlated with the historical information is included. wherein the correlation data is gradient and intercepts obtained by the least squares method or matching error. wherein the internal condition quantity of the charge accumulating device is a ratio of the dischargeable remaining capacity to a full charge capacity of the charge accumulating device. a charged input stopping means which, when the charge accumulating device is charged during learning, prevents the input of the current values and the terminal voltage values to the neural network until energy charged in the charge accumulating device is discharged. wherein the neural network is fed with type information indicative of types of the charge accumulating device. wherein the type information is digitized and inputted to the neural network. wherein the type information is represented as continuous quantity and is a numerical value correlated with an hour rate capacity. wherein the type information is represented as continuous quantity and is a numerical value correlated with an internal impedance of the charge accumulating device. wherein the neural network is supplied with the current values and the terminal voltage values so that historical information is included. wherein the historical information is comprised of time-series data obtained by digitally sampling the current values and the terminal voltage values and the time-series data is accumulated and inputted to an input layer of the neural network. wherein with respect to time-series data constituting the historical information, a time interval of sampled data inputted is made longer as it goes farther back into the past from an internal condition quantity learning time. wherein the internal condition quantity of the charge accumulating device is the internal impedance of the charge accumulating device.